Champions League: Will an English club win this season? Do English clubs have the depth and experience to go deep in this season's competition? There was a time, in the not too distant past, when English clubs feared only each other in the later stages of the Champions League. Such was the dominance of Manchester United, Arsenal, Chelsea and Liverpool that one or the other reached seven out of eight Champions League finals between 2005 and 2012 and they claimed nine out of the 12 available semi-final places between 2007 and 2009. As the group stages of Europe's premier club competition get under way on Tuesday, English clubs find themselves fighting to re-establish themselves at the top table. Over the past three seasons, England has provided just three quarter-finalists - Chelsea twice and United once - although Chelsea did win the trophy in 2011-12. This deterioration must be seen in the context of advances elsewhere. The jaw-dropping heights Lionel Messi and Cristiano Ronaldo have scaled for Barcelona (champions in 2009 and 2011) and current holders Real Madrid are part of a golden period for Spanish football. It was the era of tiki-taka, of possession-based football, that not only saw Spain win Euro 2008 and 2012 as well as the World Cup in 2010, but the Barca of Andres Iniesta and Xavi mesmerise Europe. As former Manchester United boss Sir Alex Ferguson remarked after his team were beaten 3-1 by Barcelona in the 2011 final: "Great teams do go in cycles and they're at the peak of the cycle they're in at the moment." The same could be said of Bayern Munich, who reached three finals in four years, eventually winning in 2013. They possessed a generation of gifted and technically-able German players, many of whom played their part in their national team's World Cup triumph earlier this summer - Bastian Schweinsteiger, Thomas Muller and Mario Gotze among them. There are also economic arguments. During the period in question, the weakening of the pound against the euro and the introduction, in April 2010, of a 50% tax band meant the cost of paying an overseas player a vast wage rose dramatically. There was the spectre of financial fair play and the need to balance the books - and, even though Manchester City and Chelsea have vast wealth, they were not signing global superstars. 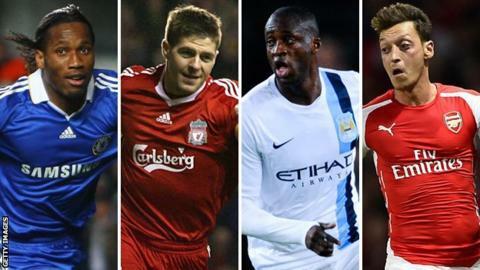 Yaya Toure and Sergio Aguero joined City, while Chelsea paid £50m for Fernando Torres. Big-name players certainly, but in Spain Real spent £80m on Ronaldo and £60m on Kaka, while Barcelona spent heavily to bring Neymar to the club. Another factor is that for much of the past four years England's biggest clubs have been in varying states of transition. Liverpool, such a force in Europe for a period under Rafael Benitez, have taken time to recover from the Tom Hicks-George Gillett regime. Benitez led Liverpool to Champions League glory in 2005 and took them back to the final in 2007, but the borrowing of the American owners finally took its toll as the banks called in debts and forced a protracted sale that damaged the club on and off the field. United also had debts to service, with the Glazer regime having borrowed the money to buy the club in 2005, and, while the brilliance of Ferguson's managerial mind kept the club on track domestically, he was never allowed to recruit the kind of global star that might have helped United rebuild after the sale of Ronaldo in 2009. United have not won the competition since 2008, although they reached the final in 2009 and 2011. Arsenal entered a period of austerity following their move to the Emirates in 2006, while the high-profile sales of Robin Van Persie and Cesc Fabregas hardly improved their prospects. Manchester City have been taking their first steps as a new superpower and are now in their fourth straight season of Champions League football. According to David Dein, the former Arsenal chief executive, it is too early to determine whether the modest achievements of recent seasons are a blip or a signifier of a more serious downward trend. "English clubs have done very, very well when you look at the figures over the past decade," Dein told BBC Sport. "The last few seasons have been more difficult but when you look at this season's competition and the slight upturn last season, English clubs have as good a chance as anyone in Europe." England and Spain have had 35 quarter-finalists since 1996, compared to Italy's 24, Germany's 22 and France's 12. Last season, Mourinho led Chelsea back to the semi-finals, the eighth time he has reached that stage of the competition in 10 attempts with four different clubs. Manchester United also reached the quarter-finals, where they were outclassed by Bayern Munich, while Manchester City reached the knockout stages of the competition for the first time in three attempts. So what are the prospects for the current season? Europe's big teams have hardly stood still. Barcelona, re-energised under new boss Luis Enrique, have added Luis Suarez to a forward line that already boasted Messi and Neymar. Real Madrid can field Ronaldo alongside Gareth Bale, the world's most expensive player, Colombian World Cup golden boot winner James Rodriguez and Germany midfielder Toni Kroos. German champions Bayern Munich have bought Xabi Alonso, the highly-rated Mehdi Benatia and striker Robert Lewandowski. But after a summer of vast spending in the Premier League, there is a sense that all four of England's representatives are more settled. Mourinho is a year into his second spell at Chelsea and has spent from a position of strength by adding Diego Costa, with seven Premier League goals already, Cesc Fabregas and Filipe Luis to an already formidable first XI. "We feel like this is our competition," said Liverpool chief executive Ian Ayre. "We are the most successful English club in the competition, it is a competition synonymous with us and our fans." "I'm convinced Chelsea will win the title this season," former Chelsea boss Gianluca Vialli told BBC Sport. "But I also believe that, with the players they have added this summer, they will be a genuine threat to the very best in Europe. It wouldn't surprise me if they won the Champions League. They look ready now." And what of Manchester City, the champions of England? Manuel Pellegrini has brought a calming sense of authority to the club and with it a confidence and belief that City belong with the best that Europe has to offer. Last season, having lost to Bayern at home, they beat the German champions in Munich and would have topped the group with one more goal. City, despite another tough draw, look a side that, like United in the mid-1990s, have taken time to come to terms with Europe, but may now be ready. Arsenal have added the experience and pace of Chile international Alexis Sanchez and the goals of Danny Welbeck during a £70m summer spending spree. They also go into this season's Champions League having won the FA Cup, their first trophy since 2005. Hopes are high in north London. Liverpool, five times European Cup winners, may have lost Suarez, but by adding Mario Balotelli, Lazar Markovic, Dejan Lovren and Alberto Moreno, they come back into the competition for the first time since 2009-10 with real hope. The season before, they dispatched Real Madrid - against whom they are drawn this time around - 5-0 on aggregate to reach the last eight. "We feel like this is our competition," said Liverpool chief executive Ian Ayre. "We are the most successful English club in the competition; it is a competition synonymous with us and our fans. "We have to be realistic, ambitious and optimistic all at the same time. Our two targets this season are to finish in the top four and qualify from our Champions League group." Another factor that might just signal the start of a upturn is the money Premier League clubs are spending once again. In 2012, the league sold its television rights for a record £3bn over three years, a 71% increase. That has meant that even in the face of Uefa's FFP regulations, English clubs have been able to spend like never before. During the summer, Premier League clubs spent an astonishing £835m, which is £160m more than was spent by clubs in Spain's La Liga and the German Bundesliga combined. Research by Deloitte shows that over the past two summer transfer windows in England, Premier League clubs have spent a total of £1.47bn, which again outstrips the combined spending of all top-flight clubs in Spain and Germany. Significantly, the average fee per player has risen gradually over the past four years, according to a report by Fifa last week. That spending is bound to have an impact. Whether it will transform an English team from contenders to champions is unknown but without doubt, this season's Champions League looks as competitive as ever.